The Bihar Combined Entrance Competitive Examination Board (BCECEB) is conducting the Under Graduate Medical Admission Counselling (UGMAC) 2018 for admission to the first year UG Medical Courses (MBBS). The admission to the Bihar MBBS 2018 is on the basis of the merit-list / Rank-List of NEET 2018 which is conducted by the CBSE. 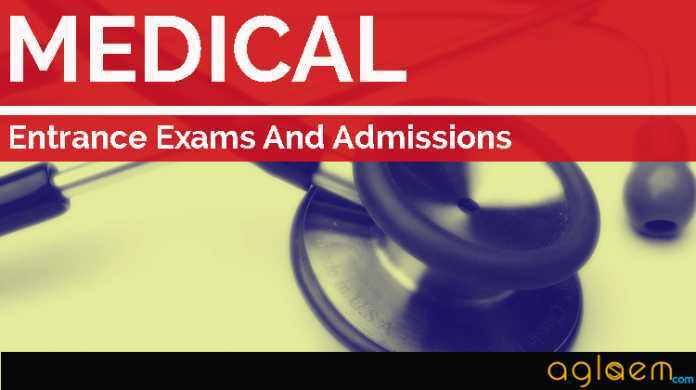 Aspirants desirous of taking Bihar MBBS Admission 2018, can apply online and submit the online application form before the due date. The applicants are also required to submit the print out of the completed application form along with the relevant documents. As per information brochure, the applicants may compete against a total of 990 seats in different govt. medical/ dental colleges in the state of Bihar. However, the number of seats in the Private Medical colleges shall be made available at the time of counselling. Candidates can check here complete details about the Bihar MBBS Admission 2018. Latest: BCECEB has released date and time schedule for for Third Counselling of Under Graduated (BUMS) Courses in Govt Tibbi College of Bihar on the basis of NEET-(UGMAC)-2018, Scroll down to check the same. Candidates can check here the schedule for Bihar UGMAC 2018 as in the table below. The counselling programme for admissions to the first year of MBBS / BDS / BAMS / BHMS / BUMS courses based on the merit / rank list of NEET(UG)-2018 will start on scheduled date in I.A.S. Bhawan, Near Patna Airport, Patna-800014 for the candidates who are successful on the basis of NEET (UG)-2018 against State Quota MBBS / BDS / BAMS / BHMS / BUMS seats for Govt. Medical / Dental / Ayurvedic/ Homoeopathic/ Tibbi Colleges and Private Medical / Dental Colleges of Bihar and who have applied Online for participating in the counselling / seat allotment for the same. Each candidate who is eligible has to appear for counselling on the scheduled date alongwith hard copy of already ‘Online’ filled part-A and filled Part-B of application form / the original certificates & documents and other required enclosures. After verification of certificates / documents/ identity, the course / institution will be allotted merit / rank wise to eligible candidates as per prospectus of UGMAC-2018. Click here to check List of Allotted Candidates in Pvt. Dental Colleges on the basis of UGMAC-2018 Second MOPUP Counselling. Click here to check notice regarding prepone date for Second Mop-up Counselling of Government / Private Dental Colleges. Click here to check the list of Allotted candidates after mop-up counselling for stray vacancies. Click here to check Important Notice Regarding Mop-up counselling against Stray Vacancies in Private Medical Colleges. Click here to check Details Regarding Mop-up counselling against Stray Vacancies in Private Medical Colleges on the Basis of NEET. Click here to check notice regarding Extension of Counselling date for Private Medical / Dental Colleges. Click here to check Details Regarding Mop-Up Counselling for Admission in Under Graduated Medical / Dental Courses in Govt & Private Medical Medical colleges on the basis of NEET. Click here to check List of Allotted Candidates on the basis of UGMAC-2018 Second Counselling. Click here to check Merit List for Second Counselling of UGMAC-2018 for (NRI Quota Private Medical / Dental Colleges). Click here to check Merit List for Second Counselling of UGMAC-2018 for (Sikh Minority Private Medical / Dental Colleges). Click here to check Merit List for Second Counselling of UGMAC-2018 for (Muslim Minority Private Medical / Dental Colleges). Click here to check the merit list of (Government Medical /Dental Colleges) on the basis of UGMAC-2018 for Second counselling. Click here to check the Application for Re-Allotment of Course / Institution has been released. Click here to check the Details of Filling up Online Application Form and option for 2nd counselling for Admission in Under Graduated Medical/Dental Courses in Govt & Private Medical Medical colleges on the basis of NEET-(UGMAC)-2018. Click here to check Important Notice Regarding Filling up Online Application Form and option for 2nd counselling for Admission. Click here to check List of Candidates Allotted in Government Medical / Dental Colleges on the basis of First Counselling of UGMAC-2018. Original Admit Card of NEET (UG)-2018. Passing Certificate / Marks Sheet / Admit Card of Matric / equivalent Examination. Passing Certificate / Marks Sheet / Admit Card of Intermediate Sc / equivalent Examination. All the Certificates in original as per the requirements mentioned in Prospectus of UGMAC-2018 (if applicable). Six copies of the passport size Photograph which was pasted on the Admit Card NEET(UG)-2018. Candidate can check the vacancy list after the counselling from the links given below. Click here to check Stray vacancies for MOP-UP counselling in Private Medical Colleges. Click here to check Vacant Seat Position BLE[Engineering]-2018. Medical/ Dental Colleges on the basis UGMAC-2018 after August 27. Medical/ Dental Colleges as after August 26. Click here to check the vacant seats after counselling on August 14, 2018. Click here to check the vacant seat position for Second counselling. Click here to check the vacant seat position for first counselling. Click here for the Merit list (UGMAC-2018) of first counselling list of Sikh Minority in Private Medical / Dental Colleges. Click here for the Merit list (UGMAC-2018) of first counselling list of Muslim Minority in Private Medical / Dental Colleges. Click here for the Merit list (UGMAC-2018) of first counselling list of Private Medical / Dental Colleges. Click here for the Merit list (UGMAC-2018) of first counselling list of Government Medical / Dental Colleges. Candidates can check the cut offs and list of candidates who are not eligible for counselling and Medical and Dental Colleges. The links for the same are given below. Click here to check Cut off Rank for UGMAC-2018 Second Counselling. Click here to check Cut off. Click here to check the List of Candidate’s not eligible for counselling in Govt.Medical/Dental Colleges on the basis of UGMAC. The candidate must be domicile of Bihar claiming admissions under 85% state quota seats. Only candidates who have studied 11th & 12th in Bihar are allowed to participate in the counselling. The applicants should have obtained a minimum of 50% marks for General, (40% marks for SC/ST/OBC and 45% for Gen-PWD category candidates) taken together in Physics, Chemistry and Biology/ Biotechnology. It shall be necessary for a candidate to qualify the NEET-2018 exam with a minimum of the 50th percentile, 45th percentile for UR-PwD and 40th percentile for SC, ST, OBC, SC- PwD, ST- PwD & OBC- PwD candidates. Click on the link which will be given on this page to register online for Bihar MBBS Admission 2018. Fill in the required details which will be asked in the step one such as email id, mobile no. etc. Candidate will receive an email and SMS. The received email and SMS will contain an “ACTIVATION CODE” which is to be used by the candidate to activate his/her account. The candidate should click “Activate Your Account” Button and enter the email_id and received activation code to activate his/her account. Thereafter click the “Submit” button. The Application Process is now over…!!! Click here to download your application form Part A & B. After successful registration and activating the account, the candidate should again “Sign in” to his/her account and thereafter complete the required entries regarding personal information on the computer screen. Then click on “Save & Continue” button. After entering the personal information the candidate should upload his / her passport size photograph of high contrast (Photo must be snapped with placard containing candidate’s name and snapping date), and full signature in Hindi and English (Not in capital letter) after duly scanning the same. After uploading photo and signature click on “Save & Continue” button. Step Four: Educational Information : After uploading the scanned photo and signature the candidate should enter his / her educational information on the computer screen and click on “Save & Continue” button. After entering educational information the candidate must verify all the information given by him/her while verifying given information in step-2, step-3 and step-4. If any information is found wrong, then the candidate should click “Back to Edit” button and make required corrections. Thereafter the candidate should click “Save & Continue” button to update the entered information. If preview of application form is found to be correct, then the candidate give his / her Declaration and click the “Confirm & Submit” button to proceed to pay Examination Fee as per Step-Six. After preview of the Application Form and submitting the same, the candidate should click “Proceed to Payment” button and complete the payment procedure according to instructions appeared on the computer screen regarding payment of Counselling Fee. There are following two modes for payment of Counselling Fee. Payment by Bank Challan: If the candidate wants to Pay Counselling Fee through Bank Challan, he / she should select offline / NEFT Challan option from Payment mode appearing on computer screen and download the Challan and get the printout of the same. Thereafter visiting any Bank upto scheduled last date, the Counselling Fee may be paid through NEFT mode. The candidate has to pay processing charge additional to Counselling Fee for payment through Challan mode. Note: Paid Counselling Fee will not be refunded. Step Seven Download Part-A & Part-B : After payment of Counselling Fee upto scheduled date and time, the candidate must download Hard Copy (Part-A & and Part-B) of online submitted Application Form and keep the same safely in his possession because it contains all information provided by the candidate and the UGMAC-ID made available by the Board for further use during counselling. All the Certificate / documents in original as per the requirements of admissions in Private Medical / Dental Colleges. Six copies of the passport size photographs, which was pasted on the Admit Card of NEET(UG)-2018. Downloaded print of Online filled Application Form (Part A & Part B) of UGMAC-2018. The candidate who will make to the merit list will be eligible to appear for Bihar MBBS 2018 Counselling. The candidates have to register online for UGMAC 2018 and pay the requisite amount. The seat allotment has to be done on the basis of the first-come-first-serve basis. The selected candidates need to bring the relevant documents in proof of Date of Birth, Category, Residence of Bihar, etc at the time of Counselling. Candidate can apply for the counselling from the given steps given on this page. 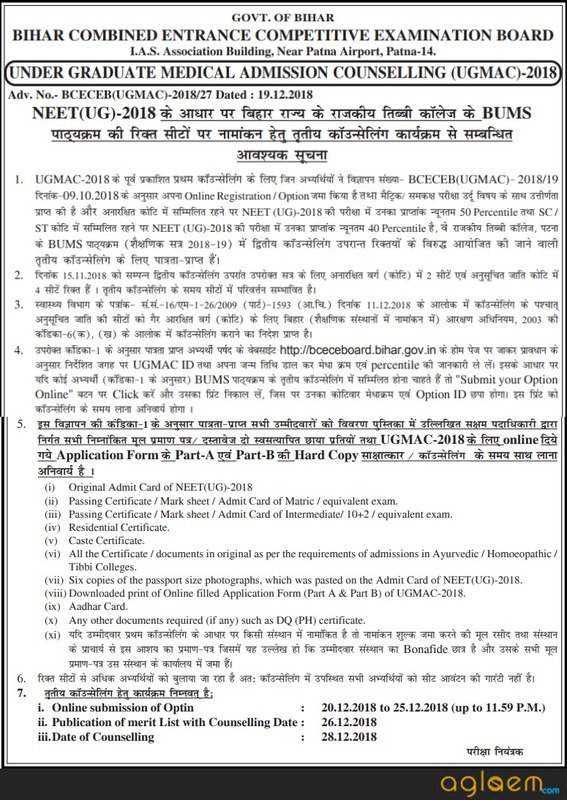 For more details on Bihar UGMAC 2018 – Download Official Notification | Advertisement. How can I apply for private medical colleges in bihar state? Sir, how can I apply for private medical colleges in Bihar state? My neet marks is 180. Will i get seat? I am permanent resident of Assam state.